Social ethical content is vital for success across your social network because, the way we act in real life is being transferred online, so it’s important to transfer our values and ethics onto social media. With technological and social advancement, the world has become a very different place. The public increasingly expect brands to have as ‘good’ a purpose as they do product or service. When they think of a brand, they think about what it stands for. Why you exist is what makes them care. Producing content that shows others you are accountable for fulfilling actions that benefit the whole of society, creates balance between economic growth and the welfare of society and the environment. And, being transparent is vital to stay successful. In essence, attention to ethics in your organisation is the right thing to do. 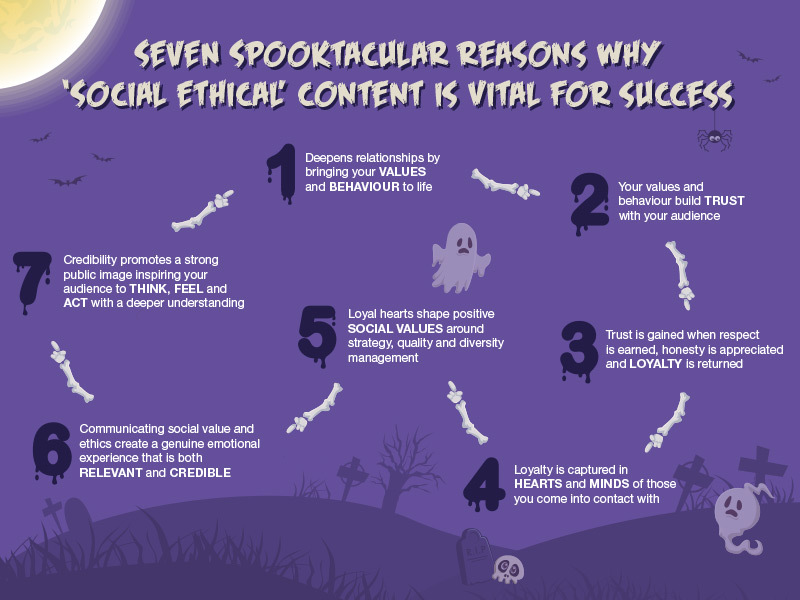 Why not take a spooktacular leap forward with credible and relevant content that captures the heart in your organisation? Grab attention with innovative, insightful and thought-provoking content for your website and social network. Why put social giving at the heart of your organisation? What does your organisation stand for?